This session was definitely my favourite. It was practical, funny, to the point, had visual aids and led by two very creative knowledgeable people: Carrie and Darren of Digital Bungalow. I took notes which I will retype (make legible) in bullet form for you. Use natural light. Sunlight can sometimes be too bright, so tone it down by putting white paper over your windows to filter the light. 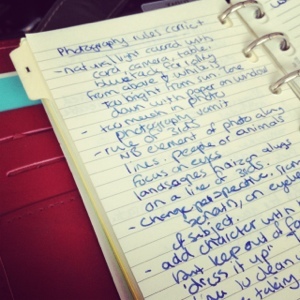 Try to keep clutter in photos to a minimum. Darren calls it photographic vomit. Clean up the vomit and the item you’re photographing will stand out more. Change your perspective. Take a photo from above, standing on a chair. Or kneel down and take it from below. Add character to the photo with items or scenery in the background, but keep that out of focus, so that the only focus is on whatever you’re photographing. The shot will be busier, but as long as the background is out of focus, it works. Take your time to clean up and tidy. If you’ve crocheted something don’t be tempted to immediately take the photo right there on the couch among all the yarn ends, coffee cup, toys, last night’s dinner plate. 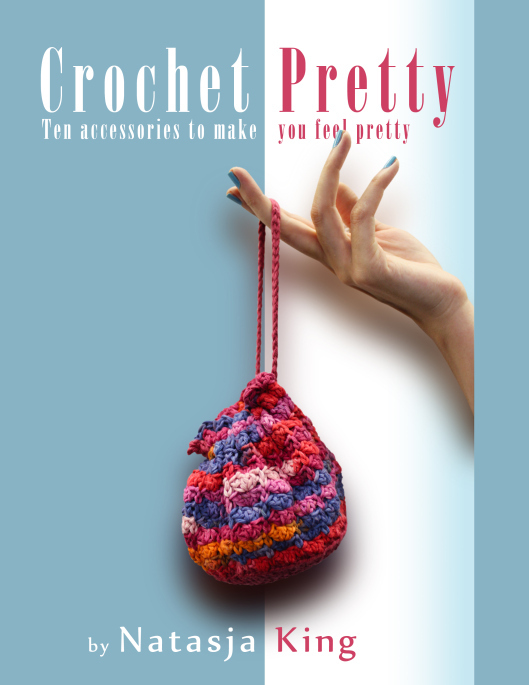 The crochet will still be there once you’ve tidied up. Take your time to think about the photo before snapping away. Rename your photos so that Google will pick it up in their images search. 324523.jpg Won’t be picked up, but blue crochet beanie.jpg will. Switch on the Grid function on your iPhone. Those grids, are the lines for the rule of thirds. Keep your camera steady by tucking in your arms. Hold your phone in your palm like a camera and use the volume buttons as shutter buttons. Follow the sniper’s rule: breath out before taking the shot. It will keep the camera steady. 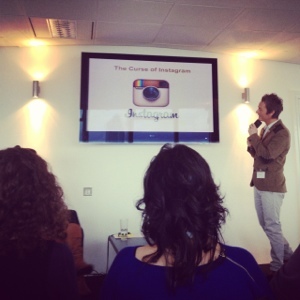 Instagram is not to be used for blogs. It distorts the colours. Darren calls it The Curse of Instagram. (Needless to say, I don’t necessarily agree with this. Obviously when I’m photographing something I crocheted I want to show you the true colour so I won’t use Instagram for that, but for other things like Alpacas on a farm or a beautiful building I will post with Instagram photos). The last very useful tip was to use Google Images reverse image search to see where else on the Internet your image appears. You click on your photo within a published post and copy that link. The go to Google Images, click on the little camera to right of the long white bar. It will expand the bar and then you paste the link and hit Enter. I tested this with a photo from my Identity Crisis blanket post, and found 9 pages with links to Pinterest and a few other blogs where that photo appears! It’s magic. I would also like to add a little something that I find very usefull for blog photos: www.picmonkey.com. It’s a web based, free for most of the stuff, photo editing tool. Brilliant! Give it a go. Thanks! Off to check out my Google images! That google images search thing sounds cool – what do you copy and past the web link of the blog post? I tried for an image that I know is on pinterest and I can’t get it to work, I must be doing something wrong – I’m such a technophobe! I think I’m going to do a seperate post just about google image search with a screenshot. Keep your eye out. This is brilliant stuff. Well-written. To the point and full of excellent hints and advice that can be used. Brilliant!! So,so trots op jou. Jy’t die holte vir jou voet gekry en nou vlieg jy. Mag dit ‘n wonderlike vlug wees. Lief jou altyd en ewig. Dankie so baie!!! I just wish everyone can find their passion and allow it to take them places. Literally. Great post. Thanks for sharing. 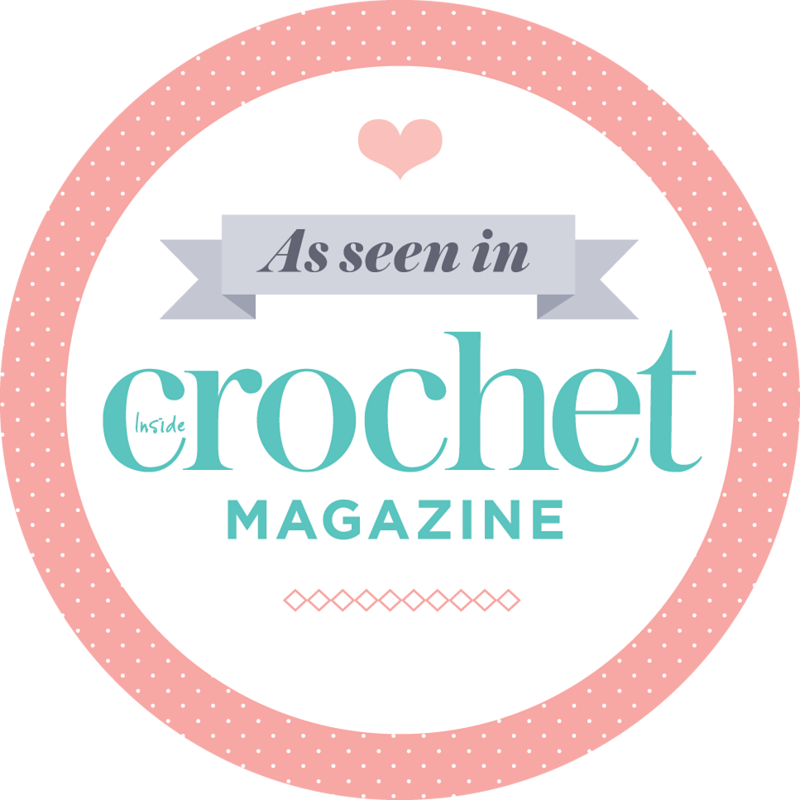 Just to add to the naming of the images for a blog, it is best practise to add something between words rather than have spaces, I.e crocheted-hat.jpg rather than crocheted hat.jpg. Otherwise in the path to that image the spaces will be replaced with %20 and this can break code and links. What a great tip. Thanks!